We’d love your help. Let us know what’s wrong with this preview of Have His Carcase by Dorothy L. Sayers. Mystery writer Harriet Vane, recovering from an unhappy love affair and its aftermath, seeks solace on a barren beach -- deserted but for the body of a bearded young man with his throat cut. With the appearance Mystery writer Harriet Vane, recovering from an unhappy love affair and its aftermath, seeks solace on a barren beach -- deserted but for the body of a bearded young man with his throat cut. To ask other readers questions about Have His Carcase, please sign up. Does one have to start at the beginning of this series or can I jump in and read this one? And that, my friends is what draws me back again and again to reading her novels. In addition, despite the fact that women in novels were (at the time) popularly showcased as sweet, innocent, somewhat dim-witted domestic goddesses, Dorothy L. Sayers was brave enough to write against the stream. The women in her books are strong, smart, independent and very capable on many levels. In other words, they are very real people rather than fantasies. This novel is the first one where Harriet Vane plays a major role. First, she finds the body, then she takes actions that are brilliant and time-saving. By the time Lord Peter gets there, all there is left for him to do is form a partnership with Harriet to try and figure out who did the deed and why. Well, that – and his daily proposals of marriage to Harriet. Two novels after they meet and he is still convinced she must marry him and she is just as determined not to. Their relationship adds a lot of spice and interest to an already fascinating murder case. While I will leave you to discover it for yourself, I will say that it is one of Dorothy L. Sayers’ most complex plots yet. Lord Peter and Harriet Vane are up against a very intelligent adversary and there is even a chapter devoted to a specific code used in a certain communication to the victim. As the chapter moves on, we follow Lord Peter and Harriet on their quest to crack the code. There are even diagrams showing how they eventually deduced the solution, and it is brilliant. This is one of the best novels I have read in this series. It has all the ingredients one could wish for in a great mystery story. And just when I thought we had it all figured out, the whole mixture gets shaken up again and we all put our thinking caps back on for more effort. By “we”, I am of course talking about Lord Peter, Harriet, and myself. I have no idea how she did it, but Dorothy L. Sayers had me involved as if I were somewhere right in the middle of the sleuthing process. This was an excellent read and would be particularly enjoyable for all fans of Dorothy L. Sayers’ writing – and particularly her Lord Peter Wimsey series. EXCERPT: She was within a few yards of the rock now, gazing up at the sleeper. He lay uncomfortably bunched up on the extreme seaward edge of the rock, his knees drawn high and showing his pale mauve socks. The head, tucked closely down between the shoulders, was invisible. 'What a way to sleep!' said Harriet. 'More like a cat than a human being. It's not natural. His head must almost be hanging over the edge. It's enough to give him apoplexy. Now, if I had any luck, he'd be a corpse, and I shou EXCERPT: She was within a few yards of the rock now, gazing up at the sleeper. He lay uncomfortably bunched up on the extreme seaward edge of the rock, his knees drawn high and showing his pale mauve socks. The head, tucked closely down between the shoulders, was invisible. ABOUT THIS BOOK: Mystery writer Harriet Vane, recovering from an unhappy love affair and its aftermath, seeks solace on a barren beach -- deserted but for the body of a bearded young man with his throat cut. With the appearance of her dear friend Lord Peter Wimsey, she finds a reason for detective pursuit -- as only the two of them can pursue it. MY THOUGHTS:😍😍😍😍.5 stars for this delightful Whimsey novel that had my brain bouncing all about my head, rather like the ball inside a pinball machine! This is one of the most complicated murders I have ever read. But also one of the most entertaining. We have the involvement of the Russians, a little reminiscent of the missing Russian Princess Anastasia, and a whole plethora of red herrings for Lord Peter and Miss Vane to fish through. The missing .5 of a star is due to the numerous pages devoted to cipher codes, which I admit to skimming. With that small exception, this remains one of my favorite Lord Peter Wimsey novels. THE AUTHOR: Dorothy Leigh Sayers was a renowned British author, translator, student of classical and modern languages, and Christian humanist. DISCLOSURE: I own my copy of Have His Carcase by Dorothy L. Sayers, published by Open Road Media. I read this book in 2016 as part of a Goodreads Group Read. All opinions expressed in this review are entirely my own personal opinions. I think Have His Carcase is the book where Sayers begins to make the transition between a standard Golden Age detective story, and the much more interesting and engaging (I find) novels which make up most of the Wimsey-Vane stories. As much as the earlier novels are fun to read, with some very entertaining secondary characters, I think this is really the point where both Harriet and Peter start to acquire the depth that they really need as characters if the reader is supposed to buy their relationship as being able to function on a level other than the standard, trope, Designated Love Interest one. The plot was, I think, overly convoluted, artificial and implausible, although still miles better than, say, Clouds of Witness (I do not think I can ever contemplate the denouement of that book without cringing a little at the sheer implausibility of it.) I'm not sure how it could have been thought to be a suicide at all, given the violence of the death-wound. I did, however, like the way in which Sayers wove the solving of the mystery in with the fact that Harriet is, herself, a mystery writer, and even a certain slyly humourous acknowledgement of the conventions of the Golden Age detective novel - I was terribly amused at Harriet's thinking that it would be very fun if the man on the rock turned out to be dead, and would therefore be found by a famous murder mystery writer, and then the dead-pan "Harriet's luck was in." There is more than a little acknowledgement of the artificiality of the genre, especially with the endless constructions and reconstructions of what might happen, and the obsessive gathering of pieces of 'evidence' that usually turn out to be worthless. There were also points in which I felt that the plot could be trimmed slightly - the solving of the code, for example. My eyes just glazed over and I skipped forwards several pages. While I'm sure Dorothy L Sayers was delighted to show us all that she had constructed a code that actually worked, I frankly couldn't have given a monkeys. This is the eighth book featuring Lord Peter Wimsey. We first meet Harriet Vane, crime writer and previously on trial for murder, in, “Strong Poison.” She then vanished in the next novel, “Five Red Herrings,” which I struggled with, and so I was pleased to become re-acquainted with her in this story. The book opens with Harriet Vane on a walking tour, when she finds the body of a man on a beach. His throat has been cut and, with the tide coming in, Harriet attempts to contact the police – but thi This is the eighth book featuring Lord Peter Wimsey. We first meet Harriet Vane, crime writer and previously on trial for murder, in, “Strong Poison.” She then vanished in the next novel, “Five Red Herrings,” which I struggled with, and so I was pleased to become re-acquainted with her in this story. The book opens with Harriet Vane on a walking tour, when she finds the body of a man on a beach. His throat has been cut and, with the tide coming in, Harriet attempts to contact the police – but this involves such a long journey that the body has vanished by the time she manages to alert anyone. The next morning the police and press are all gathered at the seaside watering place where Harriet is staying, and then Lord Peter Wimsey arrives. I enjoyed this far more than the previous, “Five Red Herrings.” Harriet Vane was more involved in this plot, but she did not take over and Lord Peter Wimsey had a large part in the investigation. Dorothy L.Sayers did not only create a fantastic sleuth in Wimsey, but gave him a good array of friends and family to flesh out the books; so we have the intrepid Bunter tailing a suspect and a mention of his new brother in law, Parker, as well as lots of local police input. Overall, an enjoyable addition to the series and I look forward to reading on. Where I got the book: my bookshelf. Continuing my re-read of the Wimsey books. The plot: novelist Harriet Vane takes a walking vacation along the south coast of England to work on the plot of her latest murder mystery, but finds the body of a young man instead. Her suitor Lord Peter Wimsey is quickly on the scene, but the investigators are puzzled. All the signs seem to point to a particular perpetrator, but his alibi for the time of death is rock solid. Something is wrong with the picture--but w Where I got the book: my bookshelf. Continuing my re-read of the Wimsey books. The plot: novelist Harriet Vane takes a walking vacation along the south coast of England to work on the plot of her latest murder mystery, but finds the body of a young man instead. Her suitor Lord Peter Wimsey is quickly on the scene, but the investigators are puzzled. All the signs seem to point to a particular perpetrator, but his alibi for the time of death is rock solid. Something is wrong with the picture--but what? Having waded through Five Red Herrings, I now feel like I'm on the downhill slope of this reading marathon. And what delights are before me--Have His Carcase, Murder Must Advertise, The Nine Tailors and Gaudy Night are, imho, the Golden Age of the Wimsey books. Sayers simply seems to hit her stride with Have His Carcase and the energy doesn't quit till Busman's Honeymoon, where Wimsey and Vane simply become too quotation-ridden to be believable. One of the beauties of Have His Carcase is the introduction of the inside of Harriet Vane's head, which is a delightfully down-to-earth counterpart to Wimsey's flights of fancy. She is practical, forthright and yet never overly wonderful--her insecurities and mistakes are laid bare for all to see, and she's definitely not always reasonable where Wimsey is concerned. The introduction of a fully-rounded character into the Wimsey books forces Sayers to make Wimsey himself more vulnerable, even as the list of his accomplishments stretches toward the exaggerated. The only place where my attention flags a bit in this book is the long explanation of the code-cracking, although it is very clever and no doubt puzzle buffs must thoroughly enjoy it. I noticed, for the first time, that my 1977 edition was typeset the old-fashioned way, making the code grids rather wobbly. I'm so glad I kept it, because it reminds me of how books used to be before all this newfangled computer stuff came in. I would truly like to own the yellow-jacketed Gollancz hardbacks (the form in which I discovered the series, in my school library) but I imagine they are collector's items and priced accordingly. Harriet Vane is going on a walking-tour of the coasts when she stumbles across the throat-slit corpse of Paul Alexis Goldschmidt. Realizing the sea is coming in for high tide and threatens the crime scene, she collects evidence and photographs and hikes her way to phone the police—and the press because she's well aware of how the story could be spun if she doesn't get ahead of it. Her only mistake: the press rat her out to Lord Peter Wimsey who arrives at the coastal village the next day, ready Harriet Vane is going on a walking-tour of the coasts when she stumbles across the throat-slit corpse of Paul Alexis Goldschmidt. Realizing the sea is coming in for high tide and threatens the crime scene, she collects evidence and photographs and hikes her way to phone the police—and the press because she's well aware of how the story could be spun if she doesn't get ahead of it. Her only mistake: the press rat her out to Lord Peter Wimsey who arrives at the coastal village the next day, ready to investigate this body of Vane's (pun...somewhat intended). And then: PLOT PLOT PLOT; CLUES CLUES CLUES; ALIBIS ALIBIS ALIBIS; etc. etc. before RESOLUTION. "By all means," said Harriet. "Where do you come from?" "From London—like a bird that hears the call of its mate." "I didn't mean you. I meant the corpse. But still, talking of mates, will you marry me?" "I thought not, but I felt I might as well ask the question. Did you say they had found the body?" 2. I think one of my favorite things in this is Harriet so clearly refusing to engage with her lust because she is just AWARE of Peter in a way that vaguely bothers her but not enough to make her STOP LOOKING, y'know? 'And he strips better than I should have expected,' she admitted candidly to herself. 'Better shoulders than I realized and, thank Heaven, calves to his legs.' GORL WHY YOU THANKING HEAVEN FOR CALVES IF YOU AIN'T PLANNING TO PUT THEM TO USE I ASK YOU. 3. I am also dying at the fact that the thing that truly slays Harriet Vane is the realization that PETER WIMSEY KNOWS HOW TO RIDE A HORSE. Harriet was silent. She suddenly saw Wimsey in a new light. She knew him to be intelligent, clean, courteous, wealthy, well-read, amusing and enamored, but he had not so far produced in her that crushing sense of utter inferiority which leads to protestation and hero-worship. But she now realized that there was something godlike about him. He could control a horse. AND THEN SHE GOES ON TO IMAGINE HIM ON A BIG OLD HORSE AND PUTS HERSELF ON AN EVEN BIGGER STEED "AT HIS SIDE, AMID THE RESPECTFUL ADMIRATION OF THE ASSEMBLED NOBILITY AND GENRTY." SHE WANTS TO BE HIS PARTNER, YO. The fact that his horse-riding (something that is a presumed norm for someone in his station) is what truly stops Harriet Vane in her tracks is...beautifully sad, encompassing (what she views as) the unbreachable divide between them. Because Harriet Vane, too, is intelligent and clean and can be courteous when she chooses and is well-read and perhaps not wealthy but not entirely a pauper, and—but horses! A new world! 4. Harriet literally has so many feelings about how she feels and also how PETER should be feeling and it's just A LOT: Silence for a few moments. Harriet felt that Wimsey ought to be saying, 'How well you dance.' Since he did not say it, she became convinced that she was dancing like a wax doll with sawdust legs. Wimsey had never danced with her, never held her in his arms before. It should have been an epoch-making moment for him. And honestly the ENTIRE fight but specifically: The fact that, until five minutes earlier, she had felt perfectly happy and at ease with this man, before she had placed both him and herself in an intolerable position, she felt somehow as one more added to the list of his offenses. She looked round for something really savage to do to him. OH HARRIET YOU ANGRY, INJURED STARFISH. AND THE PICNIC when she very much asks herself WHAT WOMAN COULD POSSIBLY NOT PICK LORD PETER HONESTLY nevermind why she's so cranky to Lord Peter IT DOESN'T MATTER: The curious inhibitions which caused her to be abrupt, harsh, and irritating with Lord Peter did not seem to trouble her in dealing with Henry Weldon. [... Henry Weldon] really imagined that, placed between Lord Peter and himself, a woman could possibly—well, why not? How was he to know? It wouldn't be the first time that a woman had made a foolish choice. 5. Lord Peter is in this, too, I guess, and he proposes ALL OVER THE PLACE ("Miss Vane, Harriet, if I may call you so, will you marry me and look after my socks, and, incidentally be the only woman-novelist who ever accepted a proposal of marriage in the presence of a superintendent and inspector of Police?" / "Not even for the sake of the headlines.") and also races to make sure Harriet is OK after suffering the 'disgusting embraces' of a potential murderer. But she now realized that there was something godlike about him. He could control a horse. I LOVE the whole fight - probably my favorite part of the entire book - but “he could control a horse” might be my favorite sentence of the book. It does so much! How can one sentence be that funny and that insightful?! kris @Liz: HARRIET IS ABSOLUTELY A JOOOOY. And Peter is a strange delightful bird. I adore them both. @Andree: It's so true @Liz: HARRIET IS ABSOLUTELY A JOOOOY. And Peter is a strange delightful bird. I adore them both. @Andree: It's so true!! Even while you desperately want them to just BE HAPPY LIVE ON KISS LOTS or whatever, there's this very real sense that they Are Not There Yet. THE TENSION, MAN. @steph: HARRIET IS AMAZING. I definitely undersold Lord Peter Wimsey, however: he is ALSO AMAZING albeit in a different, more ridiculous way. DO IT. I would say ‘another Lord Peter mystery,’ but it’s more accurate to say, ‘a Sayers book, marking the transitional point in the series where we stop having Lord Peter mysteries.’ And start having Peter-and-Harriet books, I mean. Not as enjoyable as I was expecting. Peter and Harriet are, of course, rubbing along very complexly here, with suppressed romantic sentiment (mostly Peter, but not all) and resentment (mostly Harriet, but not all). There is only one real eruption between them; the rest of I would say ‘another Lord Peter mystery,’ but it’s more accurate to say, ‘a Sayers book, marking the transitional point in the series where we stop having Lord Peter mysteries.’ And start having Peter-and-Harriet books, I mean. Not as enjoyable as I was expecting. Peter and Harriet are, of course, rubbing along very complexly here, with suppressed romantic sentiment (mostly Peter, but not all) and resentment (mostly Harriet, but not all). There is only one real eruption between them; the rest of the time they take carefully calculated shots, watch each other too closely, and very rarely get wrapped up in the puzzle and accidentally slide towards partnership. And the puzzle. I realize that the endless back-and-forth with layered theories and time tables and who-done-its and how-done-its is how this book works. It’s all about how mysteries are made, with Harriet applying her writer’s eye to the problem of constructing a solution that isn’t just possible, but balanced and right. Unfortunately, I find that style with the endless theorizing extremely tedious. But I think my real problem is that after all that commentary, those layered narratives and fictions, Peter does what Peter does – what a golden age detective does – and tootles off into the sunset, crime and victim(s) slotted in as just another pretty puzzle, just another story. That sort of thing rubs me exactly the wrong way. It’s the opposite of the modern TV crime drama problem, where every episode has a connection to the investigator’s tragical past so that the investigator is the real victim. It’s not like I’m fond of that, but in the golden age tradition, there were no victims at all, because it’s just an intellectual game. And this book didn’t interrogate that, the way it did most other parts of the mystery form. It's good but at times in this the Harriet/ Lord Peter banter just got too, too for me. Come on, I know she keeps him off for years yet, but her push/pull gets a bit arrogant and conceited to say the least. The case is good but this one for me was just overlong. Bunter is off on his own doing some inquiries too. And travel abounds all around. The part at the beginning when Harriet is just "thinking" on her walk was 5 star. I like these more when they are majority "in company" I think. Having read It's good but at times in this the Harriet/ Lord Peter banter just got too, too for me. Come on, I know she keeps him off for years yet, but her push/pull gets a bit arrogant and conceited to say the least. I like these more when they are majority "in company" I think. Having read about 1/2- I don't seem to like the roving ones as much as the ones with 7 or 8 characters at "dinner" or some event or house party or hunt etc. Some of the language is truly dated and it holds completely different meanings now- but that was not a deterrent to me, just an observation. Dago being a favorite and meaning more than just being French or dark Mediterranean or Italian but beyond that "foreign" - only in capital letters. To tell you the truth, this one with all the varying logistics for "no footprints" and "fresh blood" etc. in 25 different "maybes"- started to bore me. Not my favorite, but not the poorest- at least this one raised some witty eye brows and didn't have half the dialogue in dialect. The way Harriet and Peter interact is brilliant (and oh, how good it is to have Harriet saying no to Peter so determinedly, neither falling in love with him instantly because he's that perfect, nor agreeing to him to stop him pestering her which it is implied she did with her previous lover, nor playing him for a fool: she is as honest as she can be about how she feels and doesn't feel, and he doesn't expect or want to play on the clichés of gratitude and so on either), and their (sometimes strained) partnership as a crime-solving duo is awesome. Bunter gets some very good moments too, and the whole scenario is satisfyingly convoluted. Harriet doesn't want to ask Lord Peter, who cleared her name once before, to do it a second time, but he shows up anyway. As the two investigate the young dancer's death, one odd detail and after another piles up and the case becomes more complicated rather than less. After reading Gaudy Night and hearing Peter and Harriet refer to "the Wilvercombe affair", I was intrigued and naturally wanted to read more about these two crazy kids solving another mystery. Rather misleadingly, the book that details this case is not called "The Wilvercombe Affair", and doesn't even have the word Wilvercombe in the title. 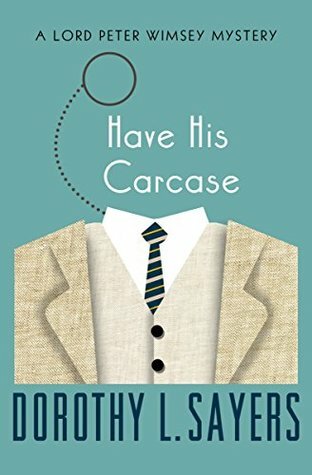 It's called "Have His Carcase", because Dorothy Sayers wants to make us work for our fun, dammit. Anyway, the mystery in a nutshell: Harriet Vane, a couple y After reading Gaudy Night and hearing Peter and Harriet refer to "the Wilvercombe affair", I was intrigued and naturally wanted to read more about these two crazy kids solving another mystery. Rather misleadingly, the book that details this case is not called "The Wilvercombe Affair", and doesn't even have the word Wilvercombe in the title. It's called "Have His Carcase", because Dorothy Sayers wants to make us work for our fun, dammit. Anyway, the mystery in a nutshell: Harriet Vane, a couple years after she is found innocent of murdering Philip Boynes, goes on a walking holiday by herself. She's wandering along the beach one day when she spots what looks suspiciously like a dead body. Because she is Harriet Vane, and this is a Sayers mystery, here's what she thinks next: "Now, if I have any luck, he'd be a corpse, and I should report him and get my name in the papers. ...'Well-Known Woman Detective-Writer Finds Mystery Corpse on Lonely Shore.' But these things never happen to authors. It's always some placid laborer or night-watchman who finds corpses." Of course it's actually a corpse, and Harriet, realizing quite sensibly that she can't move the body and that the tide might come in before she can find help, photographs the crime scene and looks for evidence. It looks a lot like a suicide, but a Highly Suspicious One. When there's something strange / In your neighborhood / Who you gonna call? Yes, his lordship the delightful Peter Wimsey skips into town, and he and Harriet start solving the mystery while having marvelous romantic tension, witty banter, and one explosive fight that was very upsetting for me, even though I've read Gaudy Night and know it all turns out okay. Let me repeat what I say in every single Dorothy Sayers review that I write: I. Love. Peter. Wimsey. He is absolutely divine, and I won't just let you take my word for it and will let him speak for himself. First, to Harriet: "And I could kiss you for it. You need not shrink and tremble. I am not going to do it. When I kiss you, it will be an important event - one of those things which stand out among their surroundings like the first time you tasted li-chee. It will not be an unimportant sideshow attached to a detective investigation." And then, to a man who insults Harriet: "Manners, please! ...You will kindly refer to Miss Vane in a proper way and spare me the boring nuisance of pushing your teeth out at the back of your neck." In this entry in the Lord Peter Wimsey series of detective novels, we find the woman he loves, Harriet Vane, back on the scene. In fact, the story opens with her on a solitary walking tour in Cornwall, discovering a body on the shore. Lord Peter, guessing that this may mean trouble for her (since she has previously been mixed up in murder), flies heroically to her rescue. Not that his heroism—or their romance—is portrayed in the sort of terms that are recognizable to most present-day readers. He In this entry in the Lord Peter Wimsey series of detective novels, we find the woman he loves, Harriet Vane, back on the scene. In fact, the story opens with her on a solitary walking tour in Cornwall, discovering a body on the shore. Lord Peter, guessing that this may mean trouble for her (since she has previously been mixed up in murder), flies heroically to her rescue. Not that his heroism—or their romance—is portrayed in the sort of terms that are recognizable to most present-day readers. He lounges about, mingling with locals and constabulary, and treats the whole mystery like a game, all the while tossing “How about a spot of matrimony, what?”-style lines Harriet’s way. She treats these offhand inquiries with all the respect they deserve, so the reader has to read both the tension and the romance between the lines. One must be attentive to realize that the police are regarding Harriet as a suspect, and to see how much she relies on Lord Peter’s devotion and esteem while appearing to reject them. About the mystery: a young man of possibly noble Russian lineage, who works as a paid dancer at a resort, has either committed suicide or been murdered by razor across the throat. Upon discovering the corpse, Harriet has the presence of mind to realize that the rising tide will soon wash the body away, so she gathers what evidence she can before leaving the scene to try to contact the police. A good thing, too, because the body is indeed gone by the time the police arrive. The police and our amateur detectives delve into the young man’s life and associates, and a fairly typical investigation ensues for most of the book. Toward the end, though, Sayers’s mania for complexity is unleashed, and she lost this reader’s interest a bit with her endless detail about coded clues and descriptions of all the highly improbable planning that went into the commission of the crime. Only one person had a serious motive for murder, which made it not very mysterious for me; all the other suspects seemed to have little reason to be involved. Another of the BBC's fantastic radioplays. I can't think why I didn't feel like listening to them for a while -- they're great, and very good company when I'm crocheting. I'm going to blame essay deadlines and such. Everyone's very well cast, of course, and the plot is easy to follow; maybe easier than when I read it, though I'm not sure if that's the audio or the fact that I have read it before, albeit the novel, not the radioplay adaptation. It suffers from a sad lack of Bunter and Parker, thou Another of the BBC's fantastic radioplays. I can't think why I didn't feel like listening to them for a while -- they're great, and very good company when I'm crocheting. I'm going to blame essay deadlines and such. Everyone's very well cast, of course, and the plot is easy to follow; maybe easier than when I read it, though I'm not sure if that's the audio or the fact that I have read it before, albeit the novel, not the radioplay adaptation. It suffers from a sad lack of Bunter and Parker, though. Most disgraceful. I appreciated this one much better this time around. Unlike with most detective stories, I remembered the twist/solution to this one so very well that I thought it must have come a lot earlier in the book than it did! There's a little setup for GAUDY NIGHT in this one, but it doesn't really get into the juicy discussions that make GAUDY NIGHT such an excellent book. It's still an extremely clever and enjoyable mystery about how fact and fiction sometimes affect each other. I'll be writing a full I appreciated this one much better this time around. Unlike with most detective stories, I remembered the twist/solution to this one so very well that I thought it must have come a lot earlier in the book than it did! Harriet, while on her walking tour, spies a lovely deserted beach whereon to eat her lunch. It's a warm day and as it often does, her meal has a soporific effect and she falls asleep. She's awakened by a cry that she first interprets as being emitted by a seagull filching her sandwich remains. She goes dancing and capering along the beach for the sheer joy of life and comes near a large flat rock. She notices something on the rock that she initially thinks is seaweed, then a sleeping man, and finally, she sees that the man is dead, with his throat cut from ear to ear. What follows is a very complicated murder investigation, full of alibis and disguises and secret identities. And yet it is very interesting, unlike Five Red Herrings. I do admit to skimming over the cipher bits - we have computers nowadays to crack codes. Still not as much of Bunter and Charles Parker - and no Dowager Duchess - as I would like, but I did adore the letter that Charles wrote to Peter. They have been searching the beach for any clues to the murder and now meet to review and discuss their findings. Harriet found, among other things, half a Bible. Peter: All right; keep it; we'll call it a clue. How about the Holy Writ? Harriet, in a marked manner: You can keep that; it might be good for you. Peter: Very well. (In a still more marked manner) Shall we begin with the Song of Songs? Peter: I just wanted to ask whether you'd given any further thought to that suggestion about marrying me. "...six foot of elm with brass handles." "My heart aches, and a drowsy numbness pains/My sense, as though of hemlock I had drunk..."
'Ain't she the snail's ankles?' asked Mr. da Soto, admiringly. "Mademoiselle, I tell you frankly that to have a healthy mind in a healthy body is the greatest gift of le bon Dieu, and when I see so many people who have clean blood and strong bodies spoiling themselves and distorting their brains with drugs and drink and foolishness, it makes me angry." "...useful as a raincoat under machine-gun fire." Wimsey considered, rightly, that when a woman takes a man's advice about the purchase of clothes, it is a sign that she is not indifferent to his opinion. Wimsey, who was rather proud of his figure, would hardly have been flattered could he have heard this modified rapture, but for the moment he was happily unconcerned about himself. "...sleek with breakfast, sunshine and sentiments..."
This is still true nearly 90 years later. Whoops! Better not say this today! "A solitary rock is always attractive. All right-minded people feel an overwhelming desire to scale and sit upon it." Continue to prefer this one to Strong Poison, mostly because Peter and Harriet can interact in less constrained circumstances. Also there is more Bunter. These are also good reading on the train. I may have liked this one better than Strong Poison this time around. That may mostly be due to the fight (which is still spectacular), but I also find that I enjoy Harriet as narrator, and as fellow semi-sleuth, and I enjoy she and Peter detecting together (off and on). Also, there is dancing. 4.5 stars, but I'm rounding up. Been reading this one off and on for the last few weeks. I do really like this one. I think I just like how everything is random and really complicated, and nothing makes sense. I like the ever-more complicated theories to try and make sense of the facts. I particularly like the moment where Harriet points out that everyone's theories are terrible, for that reason. No one would do the things that needed to be done to make the facts (as they stand at any given point in time) work. "The best remedy for a bruised heart is not, as so many people think, repose upon a manly bosom. Much more efficacious are honest work, physical activity, and the sudden acquisition of wealth." The rest of it continues as delightful, and while the BBC radioplay version doesn’t include the narrative stuff like that, it does include a lot of the delightful back and forth between Harriet and Peter — and, beautifully, the wrenching conversation they have when she wants to fight about it. Maria Aitken and Ian Carmichael do an excellent job, and honestly, that partnership is more the attraction when it comes to this book than the mystery plot. Though there are some fun puzzles and red herrings in that too, of course. Still, objectively, Sayers’ books were better when Peter was engaged emotionally, and it isn’t just a puzzle-plot like Five Red Herrings, and that shows with my affection for this one. Can’t be bothered to figure out a rating for this reread. I have read/listened to all the books with Peter and Harriet, all out of order, in the last several months. I enjoyed this, but I think it is the weakest, at least in terms of the two of them being interesting characters (there’s a little development of their relationship here, but nothing like the depth of Gaudy Night). The puzzle is interesting but I found that because I remembered the key to the solution, though not a lot of details, i Can’t be bothered to figure out a rating for this reread. I have read/listened to all the books with Peter and Harriet, all out of order, in the last several months. I enjoyed this, but I think it is the weakest, at least in terms of the two of them being interesting characters (there’s a little development of their relationship here, but nothing like the depth of Gaudy Night). I was so prepared to give this book a 5 star rating. I liked it so much more than Strong Poison. However, two things got in the way: the chapter about the cipher was difficult to follow, and I didn't feel that how they cracked the code or the specifics of the code were necessary to the plot. And, the ending was very abrupt. Other than that, I loved the complexity of the story and the way all of these different characters and aliases were introduced and intertwined. I found it very entertaining an I was so prepared to give this book a 5 star rating. I liked it so much more than Strong Poison. However, two things got in the way: the chapter about the cipher was difficult to follow, and I didn't feel that how they cracked the code or the specifics of the code were necessary to the plot. And, the ending was very abrupt. The mystery itse Reviewed for The Bibliophibian. I've read this several times over the years. One of my favorites of the Lord Peter Wimsey series. I have always remembered how Harriet Vane finds the victim on her walking tour. Someone coming across a body on a rock/boulder on the beach with a sliced throat is kind of memorable. But I apparently totally forgot about the ending. This was probably my third or fourth (maybe more) reading. The Peter Wimsey novels are one of the better known golden age mystery series, and the one which gets probably the most literary approval, as well as being known as one of THE great love stories in mysteries. And yet, while it falls well into re-read territory for me (because I like Peter) and I enjoy aspects of the romance (because Peter and Harriet are obviously so well suited to each other), I also at times thoroughly dislike the stories (because Peter is so ridiculously smothered in abilities The Peter Wimsey novels are one of the better known golden age mystery series, and the one which gets probably the most literary approval, as well as being known as one of THE great love stories in mysteries. And yet, while it falls well into re-read territory for me (because I like Peter) and I enjoy aspects of the romance (because Peter and Harriet are obviously so well suited to each other), I also at times thoroughly dislike the stories (because Peter is so ridiculously smothered in abilities, and sometimes the technical detail is over-the-top dull) and really dislike the romance. At this point in the Harriet/Wimsey progress, it's a year and a half after Wimsey proved Harriet's innocence. The very beginning of the book makes clear that she's been in recovery mode, burying herself in work to allow herself to move past her bruised and battered emotional state. She was "over" her lover by the time of the trial, having fallen abruptly out of love with him once she realised that he had lied about being opposed to marriage, and had simply put her in a situation where she had to prove her love to him most abjectly. He succeeded in getting her to live in sin by badgering her constantly, until she was finally so worn down by it she went against her own principles. So what has Wimsey been doing for the last year and half? Making as many opportunities as possible to socialise with her, and on every single occasion (it seems) asking her to marry him. Over and over and over again. Indeed, he asked her to marry him at their first meeting, in prison, while she was on trial. Harriet's position at that point was that he seemed a likeable enough person, and she had nothing against him, but, seriously, no. By the end of the trial she was also powerfully aware of two other factors: the big difference in their social status (he upper upper class and she educated and possessing of good taste, but not close to his strata) and the immense obligation to him she was now weighted down by - not to mention that she's technically no longer possible marriage material at all because of having had a lover (something she appears to feel acutely while it doesn't matter to Wimsey). Harriet was silent. She suddenly saw Wimsey in a new light. She knew him to be intelligent, clean, courteous, wealthy, well-read, amusing and enamored, but he had not so far produced in her that crushing sense of utter inferiority which leads to prostration and hero-worship. But she now realised that there was, after all, something god-like about him. He could control a horse. She goes on to picture him and her, well-dressed and admired on their horses, and then laughs at the snobbishness of it. It's written as a moment of romantic progress, but suggests a definition of love which is completely off-putting to me. On top of this is the detective 'team' of Wimsey and Vane. Putting aside the protective reasons Wimsey comes galloping down to investigate, what we have here is a potential couple investigating a crime. They both have a crime background, and both go about interviewing witnesses, searching for evidence, and brain-storming the possibilities together. Although Harriet does some respectable evidence-collection, every single deduction, useful analysis, intuition and revelation belongs to Wimsey. At least two of the bits of analysis/revelation are things Harriet says she should/does know as a mystery writer, but simply hasn't managed to apply to the current situation. The imbalance just gets increasingly marked as the story wears on. Read by the inimitable Ian Carmichael, this is one of the Wimsey mysteries that tends to get the most raves. It wasn't until near the very end that I realised that yes, I actually had read it at some point decades ago. Probably back in the mid-80s when the local British Institute had a library that was open to all who cared to pay the modest membership fee. If you like ciphers and cryptic crosswords, you'll enjoy this story. Personally, I was reminded of The Nine Tailors with its bell-ringing cip Read by the inimitable Ian Carmichael, this is one of the Wimsey mysteries that tends to get the most raves. It wasn't until near the very end that I realised that yes, I actually had read it at some point decades ago. Probably back in the mid-80s when the local British Institute had a library that was open to all who cared to pay the modest membership fee. As a modern reader bred in the tradition of "don't touch anything till the police get here", it was curious to read how Harriet Vane takes it upon herself (in the best Jessica Fletcher tradition) to photograph things, search the body, touch and move the corpse, etc. before even thinking of "oh hey, I should notify someone and get some help." And the local constabulary think this is fine, since she is a wealthy, upperclass author of detective fiction. I was intrigued by the two occasions in which reference is made to a "qualified" situation or person or whatever. I need to find a printed copy of the book and check to see if Carmichael (or possibly Chivers) felt the need to censor out the obvious qualifier "bloody"--or whether Sayers did it for us. GB Shaw used it in print; was she afraid to? If the word offended her sensibilities, why use or imply it? This review has been hidden because it contains spoilers. To view it, click here. Sayers is one of my all-time favourite light reads and I'll yield to no one in my admiration of her writing but I have to say that the plotting of her murders is often weak and here is frankly bonkers. If you were planning to kill your mother's lover, the simplest thing to do would be to run him down in your car one day. Failing that, jump on him one dark night and stab him. If you have to, ring him up and arrange a rendezvous to do either of the above. Hurry back to your farm and no one can eve Sayers is one of my all-time favourite light reads and I'll yield to no one in my admiration of her writing but I have to say that the plotting of her murders is often weak and here is frankly bonkers. If you were planning to kill your mother's lover, the simplest thing to do would be to run him down in your car one day. Failing that, jump on him one dark night and stab him. If you have to, ring him up and arrange a rendezvous to do either of the above. Hurry back to your farm and no one can ever pin it on you. Wear a disguise, perhaps. But really the ridiculous elaboration of the actual plot defies belief, involving, as it does, three conspirators, two false identities, a set of cypher letters being posted from Warsaw,visits to a London agent (who can then later incriminate you), the purchase in an incredibly roundabout way, of a highly recognisable and traceable weapon, a fairly-easily penetrated fiction accounting for Alexis getting the razor which involves the unknown conspirator placing himself at the centre of the picture, the gamble that Alexis won't have told anyone, and that one isn't going to be seen while galloping along a mile of beach. It's a nonsense. As Harriet herself says when decrying some theories about the murder: it smells of the lamp. In fact, take back what I said above: if you are going to risk letting two other people in on your murder, with all the opportunities for blackmail and double cross that that invovles, then get your co-conspirator to do the murder, while you are loudly hosting a meeting or something back at your farm. And if you are going to insist on carrying out the plot in the preposterous way you've planned it, don't, I repeat don't, then come back to the scene of the crime after the murder and hang around long enough for the female detective to spot that she's met you before. This probably wins my vote for the most unlikely murder plot ever concocted, though good old Lord Peter does his best to justify it all by admiring their triple-strong lines of defence and alibi. Dorothy L. Sayers’ Lord Peter Wimsey mysteries tend to fall in one of two camps: cleverly plotted mysteries without any unwelcome material, like Busman's Honeymoon, or mysteries so encumbered with sermonizing, lecturing or philosophizing that the reader loses sight of the clever plot, as in Gaudy Night, which almost made me give up on the franchise. Have His Carcase falls more in the former camp than the latter. While Sayers includes a few too many dead ends, which slow down the action, readers w Dorothy L. Sayers’ Lord Peter Wimsey mysteries tend to fall in one of two camps: cleverly plotted mysteries without any unwelcome material, like Busman's Honeymoon, or mysteries so encumbered with sermonizing, lecturing or philosophizing that the reader loses sight of the clever plot, as in Gaudy Night, which almost made me give up on the franchise. Have His Carcase falls more in the former camp than the latter. While Sayers includes a few too many dead ends, which slow down the action, readers will find the denouement brilliant. Mystery writer Harriet Vane discovers a Russian ex-patriate and gigolo dead on the beach with his throat cut. As with a locked door mystery, in which one must untangle how the murderer could have gotten in and/or out, the secret to Have His Carcase is discovering how the suspects could have committed the crime at a time in which they have unbreakable alibis. Due to dogged detective work, Vane and especially her love Lord Peter solve the riddle. While Harriet Vane begins the novel behaving like a prickly prig, by the novel’s end she has shaped herself up into some semblance of a decent person. If she had continued in the same vein, I don’t know that I could have plodded through 440 pages of ungracious sniping. Have His Carcase isn’t for those who like their mysteries action-packed and direct; however, for those who love a British cozy from the Golden Age, the novel will be just their cup of tea. This is the first of Sayers's Wimsey novels I've read. As far as detective novels go, it's interesting, not in the least when the crime being investigated becomes impossible to have been committed. However, what I find more interesting is Sayer's explorations of Wimsey as a person. I don't know about earlier novels, of course, but none of the short stories I've read do this. In each of them, Sayers holds the reader at length from Wimsey. He's always a distant figure, almost remote. But, using Har This is the first of Sayers's Wimsey novels I've read. As far as detective novels go, it's interesting, not in the least when the crime being investigated becomes impossible to have been committed. However, what I find more interesting is Sayer's explorations of Wimsey as a person. I don't know about earlier novels, of course, but none of the short stories I've read do this. In each of them, Sayers holds the reader at length from Wimsey. He's always a distant figure, almost remote. But, using Harriet Vane, Sayers gets us right in close to the man instead of the detective. By the time I finished this novel, I felt I knew the 'real' Peter Death Bredon Wimsy, which is good, since I needed to for the next novel, Gaudy Night. Vane herself is interesting. I've not yet read Strong Poison (although I rather think I need to now), but reading this, I get an idea I'm looking into at least some facet of Sayers herself. This isn't surprising, since both are women who write mysteries for a living at about the same time, and it may not be true. But I'm sure if nothing else we get some of the environment Sayers moved through, and that in itself is fascinating. Why only four stars? As the story progress, Vane is shoved to a supporting role. Too many recapitulations. Probably realistic, but boring. Sayer’s eagerly displays local dialect again, to the detriment of readability. Many casual racial slurs at “dagos”, who seem much broader than people of Mediterranean origin.